Whether through our own fault or not, we sometimes find ourselves in situations that compromise the appearance of our teeth. Over time, those minor compromises leave us with teeth that are chipped, cracked and discoloured. At that point you have a problem you can’t smile your way out of. At Ria Family Dental, those minor imperfections are that – minor. We can easily give your teeth a makeover with our cosmetic dentistry services. Each option suits a specific need and guarantees a brighter and more dazzling smile. Dental bonding is one of our cosmetic dentistry options and is popular for giving amazing quick results. If you have chipped, cracked or discoloured teeth, dental bonding might be the best option for you! Dental bonding is a cosmetic dentistry option that provides amazing results in just 30-50 minutes. It involves the bonding of a resin-material directly onto the damaged tooth. The material matches your natural tooth shade, so the result is a natural looking alteration. Dental bonding is a one-visit dental procedure and is one of the most conservative and least expensive cosmetic dentistry options. Below are the remarkable benefits of dental bonding. Take a look. Preparation – A dental hygienist will clean and prepare your teeth for the procedure. This will determine your natural tooth shade colour on which your dentist will base the shade of the bonding material. Bonding – The target tooth is prepared and its surfaces are roughened. The conditioning liquid is applied followed by the resin material. The resin is shaped and smoothed into the desired result. 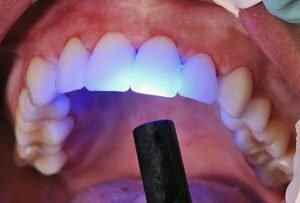 Curing – A special ultraviolet light is used to harden the bonded resin. After curing, final shaping and trimming are done. Just those steps and you’ll have your improved smile in no time! You are one visit away from getting your dazzling smile with dental bonding. It’s a hassle free ticket to the smile of our dreams at Ria Family Dental.